When it comes to diet everything revolves around food and useful, nutritious components found inside. However, it’s not always easy to save all of those vitamins and healthy minerals, especially if you’re buying food in bulk. A food dehydrator is very useful appliance which draws the moisture out of the foodstuff and helps by prolonging the expiration date. You can make delicious snacks out of anything in a quality food dehydrator. The appliances are especially good if you want to dry fruit or jerky. However, finding a quality dehydrator isn’t an easy task. The market is flooded with various units, and many of them are simply not worth buying. We are here to offer you a better insight into the specifications and features of the Presto 06300 food dehydrator. This way, if you’re planning to purchase one for yourself, you’ll have all the necessary data about it in one place. Go ahead and read this review, you’ll certainly find it useful and helpful. This product weighs around 7 pounds, and you can bring it with you, even while traveling. It’s very compact, and it doesn’t take much free space in the kitchen. The power cord can be stored in the base of this dehydrator thus saving space. The trays can be aligned vertically in a nested style when you’re not using them. Taking unnecessary trays off reduces the height of the unit. The top of this product is made of transparent polycarbonate. By having a see-through lid, you can continuously monitor the drying process. Because this unit doesn’t feature a thermostat, you’ll have to check the process occasionally, especially if you’re drying sensitive stuff which requires less heat and more control. It is a great feature because you can intervene as soon as something doesn’t go according to plan and not jeopardize the dehydration process going around the other trays. The Presto 06300 comes with a bottom-mounted fan and a heating unit. All trays are heated in an even manner thanks to the vertical airflow and the compact design of this dehydrator. The best thing about this method of food dehydration is that you don’t have to rotate or interact with the content during the dehydration process. Many other units require constant tray rotation whereas this doesn’t. Although it’s a compact unit, it comes with a very powerful 600W system. 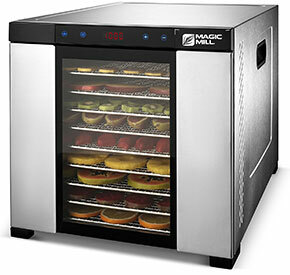 The vast power allows it to tackle great amounts of humidity, and dehydrate even the moistest food. Various parts of this dehydrator are also dishwasher safe which means you don’t have to clean the unit by hand every time you dehydrate food. The performance of the heating unit and the temperature range directly depend on the amount of overall power within. By having such a powerful system, it doesn’t have an issue to achieve the max temperature range fairly quickly. The vertical airflow allows a dispersion of heat in an even manner. Unlike the products with the horizontal airflow, the vertical method prevents the flavors from mixing. The integrated fan ensures a constant flow of hot air. The Presto 06300 comes with four trays by default. However, you have the ability to widen the capacity by adding another four trays on top. This system is what makes this dehydrator so versatile. It doesn’t matter if you’re drying food for ten people, or just for yourself, you’ll always be able to use this product efficiently. The most important element here is the power saving. The more trays you add, the more power is required. If you don’t need all eight trays, you can easily take off the redundant ones and save a lot of power. There are a few additional accessories included with the Presto 06300. You will get additional roll sheets for fruit, coated mesh sheets, drying trays, and jerky spice kits. A recipe book is included with the unit containing a lot of useful tips for a healthier diet. Because this product doesn’t have a thermostat, it operates in a different way. It has a pre-set temperature of 165 degrees Fahrenheit. 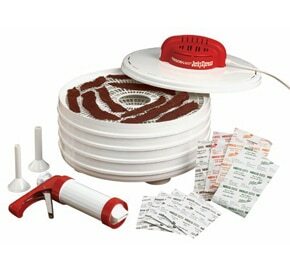 This product is classified as a stackable dehydrator because it has a fan which is mounted at the bottom if this product. The dimensions of this appliance are 14” x 15” x 6″, and it weighs around 7 pounds. The output power of this unit is 600W which is more than enough to conquer even the moistest foodstuff. The manufacturer offers a one-year limited warranty to the users. There are many upsides of this product. We made a short list of the few most important ones. As we said, it is a pretty compact product, and it doesn’t take much space in the kitchen. It’s also upgradeable without taking more space due to the horizontal tray stacking system. It looks neat, and it has a modern design. This appliance is very easy to use. There are no complicated menus, redundant buttons, and so on. Everything is pretty straightforward. All you have to do is plug it in, and you’re pretty much done! The transparent lid, fruit sheets, and drying trays all come in handy and are very useful. For example, the transparent lid gives you constant information about the state of the dehydration without even opening it. It’s very well-made, and it’s BPA-free. It also comes with an affordable price, so it’s suitable for anyone’s budget. The price-to-quality ratio is very good. It isn’t a professional appliance by any means, but it will last a long time, and it serves its purpose. There are some things we didn’t like, but it’s nothing major. Here are the most notable ones. The absence of thermostat is a pretty big thing. It means that you cannot regulate the temperature inside the unit, but let it operate on max settings. However, there are numerous delicious recipes included in the book that you’ll get with this dehydrator, so you don’t have to worry about not knowing how to operate a unit without a thermostat. Remember to keep an eye on the dehydrator, or else you’ll end up with over-dried food. This dehydrator is considered noisy, and it’s not advised that you use it at night while the residents are asleep. This unit doesn’t feature a timer, and some people consider it a downside. The only downside is that you’ll have to check out the unit occasionally. You can easily prevent this by purchasing a simple kitchen timer. This product tends to get hot after a while. Make sure you’re wearing kitchen gloves if it’s been turned on for a couple of hours. 1. Can I dry fruit in this unit? Yes, you can. You can also dry jerky. Read the recipe book; there are a lot of useful recipes in it. 2. Does it consume a lot of power? This unit has 600W of power which is not considered to be a lot. However, it all depends on how often you use it. Overall, it shouldn’t drain a vast amount of power. 3. Is it hard to use this product? Not at all. It’s pretty simple and user-friendly. All you have to do is turn it on and follow the instructions from the manual. Maintenance is pretty simple. Check out which parts are dishwasher safe in the manual, and you’ll save yourself a lot of time and hassle. 5. Is it safe and BPA-free? Yes, it is. Every single component of this dehydrator is BPA-free and non-toxic. If you’re looking for an affordable appliance with a lot of useful features, this might be the one. It has a lot to offer, and it will help you improve your overall well-being. Although it has a few drawbacks, it’s nothing unsolvable or insurmountable. It has a great 4.4-star rating on Amazon which is a good indicator of high quality and satisfied customers. If you decide to purchase it, you won’t regret it; it’s worth every penny.